There is nothing cuter than the family decked out in holiday pajamas on Christmas morning. We love the idea of putting the family in the cutest red and green pajamas, serving up some warm hot cocoa, and watching a marathon of A Christmas Story. (And capturing the whole thing in a great picture.) As sidebar, one of my brands for kids is Hannah Andersson, not only because the style are cute, but because the fabric is always so soft and wonderful. I just know the kids will love to wear their clothes. Apparently the Kardashians like Hannah too! 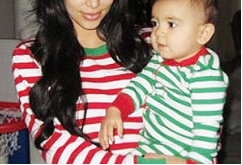 Check out this cute pic of baby Mason and Kim in Hannah’s holiday stripes.